Last spring in Texas there was a massive disturbance involving members of various biker gangs and local law enforcement. 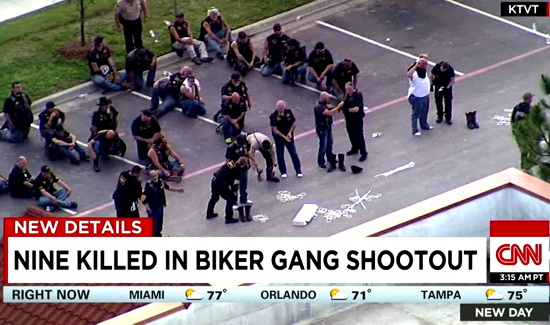 During a shootout between bikers and police, nine bikers were shot and killed. Whether or not the victims were shot by each other or by responding officers has yet to be determined. The Associated Press reports that after reviewing 8,800 pages of evidence—apparently leaked to the news organization—some of the bikers were hit by rounds fired by officers, but the details are still murky. “The gunfire included rounds fired by police that hit bikers, though it isn’t clear whether those rifle shots caused any of the fatalities,” the AP’s Emily Schmall reported. “Investigators have offered scant details about what sparked the fight or how the gunfire played out, and no one has been charged.” Eighteen bikers were wounded but managed to survive the melee. Needless to say, any time there’s a mass shooting that leaves nine dead and no charges are filed until six months later, people are going to have some questions.